Dhondutai Kulkarni was born in Kolhapur, Maharashtra. It was her father, a school teacher, introduced her to classical music and stood by her side when it was considered taboo for girls from Brahmin families to sing back then. She became a performing artiste on the All India radio at the age of 8. As a child, she was fortunate to have met and interacted with the great Alladiya Khan himself. She started learning music at the age of 5 from Natthan Khan, the nephew of Alladiya Khan, for a brief period of 3 years, after which started to learn from Bhurji Khan, the son of Alladiya Khan. She studied under Bhurji Khan for a period of 10 years until his death in 1950. By then she was giving public concerts and broadcasting from AIR. She then went on to learn from Laxmibai Jadhav, who was a disciple of Haider Khan (Alladiya Khan’s brother) and learnt with her from 1957 to 1960. Dhondutai also received invaluable guidance and a vast repertoire of rare ragas and compositions from Azizuddin Khan (Baba), grandson of Alladiya Khan, during this period. When the unparalleled Kesarbai Kerkar agreed to accept one disciple who would prove worthy of her knowledge, Dhondutai – with some coaxing from Baba – wrote to her, expressing her desire to train under her. Her talent and perseverance happened to impress the fiery Kesarbai, who taught her for almost 10 years (from 1962 to 1971), making Dhondutai her sole disciple. Dhondutai was one of the few musicians who kept the essence of the Jaipur-Atrauli gharana alive in its purest form. She was known for being a purist. Her full throated shuddha aakaar, enunciation of the syllables of the bandishes, particularity in pronunciations, and application of a ‘manly’ voice made her music heavy for the uninitiated listener, but never did she attempt to dilute a raga or compromise on her singing to suit her listeners. She was considered a musicians’ musician. Dhondutai’s gayaki was a consolidated mixture of the gayakis of all her gurus. 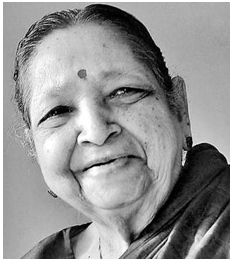 She was especially known for her command over jod and sankeerna ragas typical of her gharana, which sang effortlessly. She never took to singing any semi-classical genres. She spent her entire life in service of music, sacrificing all pleasures of material life. She generously imparted her precious knowledge to her disciples and continued to teach until the very end, for she was committed to passing on the legacy of the gharana. Her list of disciples includes Vasantaro Karnad, Manjari Vaishampayan, Namita Devidayal, Manjutai Modak, Smita Bhagwat, Deepak Raja, Sanjay Dixit, Aditya Khandwe, Rutuja Lad, Deepika Bhide and Jashan Bhumkar among others. Dhondutai’s contribution and dedication to music was recognised by several organizations and she was bestowed with numerous honours. The Sangeet Natak Akademi award, 1990. The title ‘Gaan Yogini’ was conferred upon her. Mallikarjun Mansur Award from the Bangalore Kidney Foundation in 2009. Maharashtra Gaurav Award from the Government of Maharashtra. She also received an award from the former President of India R. Venkataraman. She authored the book ‘Sur Sangat’ in Marathi. Her father’s contribution in Dhondutai’s life is immense for it was he who constantly supported her for as long as he was around. He in fact even sold his house in Kolhapur and moved to Mumbai so that she could learn from Kesarbai and pursue a career in music. Dhondutai passed away in her Mumbai home on June 1st, 2014, due to kidney failure, leaving a huge void in the world of Hindustani music.